Laudetur Iesus Christus! … Happy Thanksgiving & Happy New Year! … of course I am referring to the new Liturgical Year for the Church which begins this coming Sunday. Attached below are some updates for the Charlotte Latin Mass Community for the month of December. 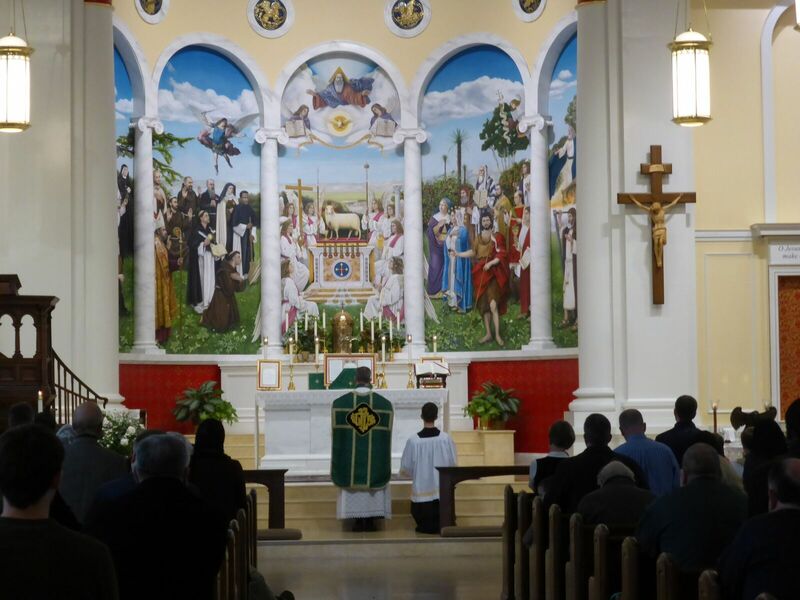 While last Sunday wasn’t the first Mass offered with the new mural, it was special in that it was the first public Latin Mass with the priest offering the Mass in the direction of the mural. As the five panels all draw our focus to the center panel with Christ the Sacrificial Lamb, when the priest is offering Mass ad orientem (towards the east), the theological connections are magnified. For instance, during the concentration, from our view we see the blood from the Lamb spilling right into the priests chalice. Just prior to the Canon of the Mass the priest invites us to join him in converting (from the Latin conversio, meaning ‘to turn’) our hearts to Christ with the Orate Fratres (Pray Brethren) and the ‘Sursum Corda’ (Lift up your Hearts). What a great aid it is for us to follow these calls when the priest and the congregation pray in a common direction, united together towards Christ the Sacrificial Lamb who has revealed himself to us. What a great aid too for passing along the Catholic Faith to our children. This video series is broken into 13 talks that cover all aspects of a beginners’ introduction to the Latin Mass. There is a lot of content here to view. If you have questions, this is a great resource that is worthy of an investment of your time. For instance, there is a talk specifically on How to Use the Missal and another one on Postures (when to sit, stand, & kneel). Most importantly, if you are new, don’t be intimidated. Don’t worry about getting everything just right … all that will come in time. Just follow at your own pace and feel free to ask for help if you have any questions. It isn’t your fault that this is new to you. 3. CLMC Coffee Donuts for Gaudete Sunday: On December 13th after the 12:30 Mass the CLMC will be hosting a Coffee & Donuts reception in the Church vestibule. In the past year we have had a lot of new people join us for Mass. If you are new, please join us and meet some new friends. I pray each of you and each of your families have a blessed Thanksgiving. If you are traveling, travel safe.